For some time, we have felt that there was something missing from our collection. We however still wanted to remain true to our vision of offering brides something different from the norm. So in September we visited the Harrogate Bridal Show looking for something unusual that would complement our current designers and my oh my have we found it! We had previously admired the stunning photo-shoots which Eliza Jane Howell had posted on Instagram, but these were nothing in comparison to seeing their gowns up close. They literally took our breath away! Our love for the luxe brand was instantaneous and there was no way we were not bringing them back to Liverpool with us. Designed by the renowned Gill Harvey, and named after her fashion designer grandmother, each vintage inspired hand-beaded wedding dress is individually made using traditional and contemporary methods. 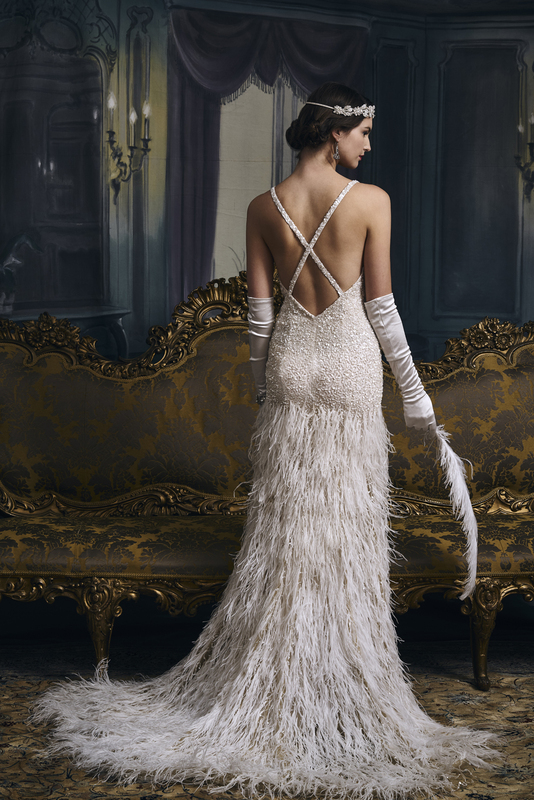 Eliza Jane Howell are the perfect choice for the bride who wants to look like she has stepped out of another era. Every single dress is truly exquisite which made it extremely difficult to choose our favourites, but after much deliberation we finally decided on 6 gowns which will be arriving in January 2019. In the meantime, we have been very fortunate to loan the beautiful Tracy Lord, Miss Adelaide and Sibella, and these are available to try on in our boutique now.